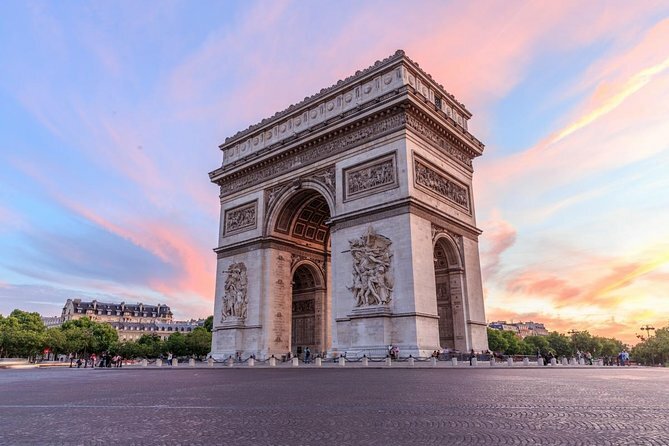 Skip-the-Line and take advantage of your visit of the Arc de Triomphe, the legendary Paris monument overlooking the Champs-Elysées, one of the largest avenue of the world. Enjoy a captivating exhibition, climb up to the terrace, and take a full grasp of this Napoleon impressive monument dedicated to his army. - Admission to all national monuments is free of charge to people under the age 18. - Due to public security reasons, bad weather or a ceremony, access to the monument may be temporarily closed. - The monument is unfortunately not accessible to wheel chair users. Visit the Arc de Triomphe and get to see the world’s most beautiful avenue as a whole. You will be provided with information leaflet in the language of your choice. Started to be built in 1806, the Arc de Triomphe comes from Napoleon's will to give a tribute the victories of his army. You will discover what inspired the architect Jean-François Chalgrin, the evolution of this great architectural project, and grasp this monument symbolic and commemorative essential function in the French national republican consciousness. Check the exhibition about Unknown Soldiers and learn more about the Unknown Soldier from the Great War, attend the daily 6.30pm eternal flame ceremony, and soak up the French military history. Climb up to the terrace and enjoy beautiful views across the city at the time of your choice. Climbing 284 stairs to see an amazing view. You go through the tunnel at the champs élesse and you don have to stand in the long long so just keep moving to the entrance. The perfect monument to do at your own pace. The stairs are narrow and I did not see an elevator so be sure your party is ok to climb stairs. I always use Viator to book our tours and skip the line tix before heading to Europe. Every purchase, tour or tix has been a smash! I'm writing on this trip to the Arc de Triomphe because it sums up how great these are. And this was just for the tix. We planned it for the day we landed day after Christmas knowing we'd be toast and not wanting to waste any time in Paris. We dropped our bags at the hotel and walked through the Tuileries Garden, crossed the Place de la Concorde and down the Champs-Élysées to the Arch de Triomphe. We followed the signs and went underground to cross the street to find the entrance where there was a long line of people waiting to get up. I just said keep walking...as we passed them all. At the front of the line we showed out tix and instantly were flagged in the first gate. Then to security. Again, flagged in for an instant check and in. We climbed those spiral stairs only to land on the benches up on top to rest! LOL Once we regrouped knowing we needed a nap before we tackled the rest of Paris, but we walked outside to the best views you can imagine all in about 10 minutes! Amazing. We are a big fan of Viator. Use them all the time. This was a self guided tour. It was worth watching the short video at the top inside to learn about the history of the Arc. I would have taken a guided tour if I had researched a good guide first. Great views of course and wonderful to learn a bit of history. It was also the day before Bastille Day so the roof top was covered in barriers and camera equipment for the next days parade. This created obstacles to move around once the terrace became more crowded. I would not recommend attending on this day if you can avoid it. The soldiers uniform museum inside is worth some time and not crowded. Most people were not interested in it though. I spent some time there while the wife was in the gift shop. We booked this while sitting under the Arc de Triomphe waiting for the ticket office to open and seeing the queue getting longer and longer. A warning though that there are many stairs to the top so be prepared. Ticket taker noticed that I had a special stocking on one leg broken toe and he asked if we wanted to take the elevator up to the first level. What a relief as the steps to the top were an easy climb. It's an easy place to walk around on the top. The memorial in the center was also a special place to remember the sacrifices of those in the war. At first we didn't think it would matter to skip the line, but in Paris there are two lines for everything: 1 to buy tickets and 1 for security. Here it matters to skip the line, we walked right up to a separate entrance and separate security line. This really matters since the lines for security are longer than any line for tickets. Also, unless you are elderly or disabled, this admission is to climb about 15 flights of very narrow, winding stairs to the top. The lift is reserved for those who need it so don't think you're getting a ride to the top. If you can do this just before the monument closes for the evening the sunset is beautiful and the views from the terrace are amazing. We combined all of our Viator tours with the hop-on-hop off bus for easy transport around the city which was also money well spent. It was ok and it involved too much of climbing. I will not recommend this kind to elderly and aged and also with tourist having problems with their legs. I saw many oldies climbing and even youngsters they were panting for breath. Not worth visiting !! and even access to it by Subway is troublesome. ! !